According to the World Health Organization, one in four people in the world will be affected by mental or neurological disorders at some point in their lives. Furthermore, there’s a staggering 450 million people around the world who suffer from mental health disorders. Thus, it’s one of the leading causes of ill-health and disability. In the US, about 42.5 million American adults suffer from some mental illness every year. These conditions include depression, bipolar disorder or schizophrenia. One of the major concerns of patients suffering from these conditions are the continual use of synthetic drugs as maintenance. There are also side effects to these drugs that can affect a person’s well-being. Prescription drugs only target a specific issue, or have a singular therapeutic effect, that may not address other issues which a person needs to treat. However, mental health disorders affect an individual’s entire being – emotionally, mentally, physically and spiritually. If you’re looking for a treatment that will address all health concerns connected to your mental health, acupuncture for depression can provide a way for you to achieve holistic healing. There have been studies from around the world that confirm the positive health benefits of acupuncture for mental health disorders. John Allen from the University of Arizona and the acupuncturist Rosa Schnyer conducted one such study. They studied the effect of acupuncture for depression on patients for a period of eight weeks. The findings consequently suggested that using acupuncture alone could be effective as other treatments for relieving symptoms of depression. Each person suffering from a mental health issue will have a specific treatment method uniquely catered to them. For example, not all patients are the same, as they have different physiologies and unique concerns. If there are 20 people suffering from anxiety, each one of them will have their own customized treatment of different acupuncture points, prescription of different herbs, and different recommendations for diet and lifestyle. This is because Oriental Medicine doesn’t see a mental disorder as just one syndrome to address, it aims to treat various symptoms that affect a person. Your treatment plan will target an imbalance of these elements. In this case, Acupuncture can help treat the root cause of the problem by rebalancing the body’s internal environment. Needles will be inserted at specific points to remove blockages and promote better energy flow in the body. It can then help alleviate symptoms associated with the disorder. There will be a brief moment of discomfort when a needle is inserted on certain body points. While the needles are there, you will barely feel anything. Some could feel an immediate effect after a session, while people with more chronic ailments would require regular follow-up treatments. The best thing about acupuncture is that it has virtually zero side effects. Those that receive acupuncture for their anxiety see results after just one session. The restoration of balance within the body provides many physical, mental and emotional benefits. Santa Barbara Herb Clinic offers a wide variety of holistic healing treatments for modern-day ailments. Here, you can also seek out acupuncture for depression and other similar issues. 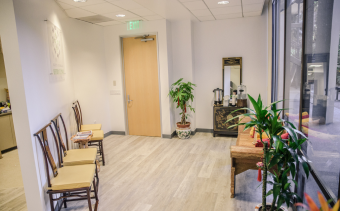 Your session with our licensed acupuncturist and Chinese medicine practitioner will include a thorough assessment and unique treatment specifically catered to your health concerns. Book a session now and start your journey towards holistic health and wellness. Aging isn’t a walk in the park, but you can help yourself age more gracefully with acupuncture for orthopedics. When our golden years hit, our bodies just won’t work as well as they used to. Our hearing and eyesight will worsen, our hair will turn gray, and our skin will wrinkle and sag. Aging can also be quite hard on our bones, making it more difficult to move around and go about our business. Luckily, however, acupuncture can help with orthopedic issues related to aging. While acupuncture will not be able to reverse the aging process, it can help make it so much easier. There are a number of orthopedic issues that may arise as we grow older. The elderly are more prone to medical conditions like osteoarthritis and osteoporosis, as well as issues like fractures and dislocations. In the case of osteoarthritis and osteoporosis, acupuncture for orthopedics has been found to be an effective aid in managing and even possibly preventing the two diseases. Osteoarthritis can hit you in the joints, while osteoporosis weakens your bones and makes them more susceptible to fractures. Both can be manageable, though once they develop, the process can no longer be reversed. As the most common type of arthritis, osteoarthritis is known to affect millions of people across the globe. It is common among the elderly, especially among women. Risk factors such as genetics, obesity, injuries in the joints, bone deformities, and having an occupation that puts stress on particular joints can all make you more susceptible to developing osteoarthritis. You may have osteoarthritis is you have pain and stiffness in any joint. The joint may also feel tender and inflexible, giving off a grating feeling when try to flex or bend the joint. Osteoarthritis is a degenerative disease, which means it can get worse as time passes. Unmanaged osteoarthritis can cause pain and stiffness in the joints, eventually preventing people with the disease from working or accomplishing many daily activities. Osteoporosis is quite different from osteoarthritis. Where osteoarthritis affects the joints, osteoporosis affects the bones themselves. Another difference is that osteoporosis doesn’t have telling symptoms; people with osteoporosis may only discover the disease when their bones experience a fracture. This is a disease that causes bones to weaken and lose density, thus making them more susceptible to fractures and breaks. A doctor can take x-rays of your bones and measure their density to figure out if you do indeed have osteoporosis. As in the case of osteoarthritis, women are more prone to developing osteoporosis. However, there are also other risk factors. Genetics, a history of fractures during the adult years, a history of rheumatoid arthritis, and a family history of osteoporosis are all risk factors. Things like smoking, high alcohol consumption, a low birth weight, a sedentary lifestyle, and a lack of calcium and vitamin D can all increase the risk of osteoporosis as well. For many people, acupuncture may not be at the top of the list when it comes to remedies for the symptoms of various illnesses. This may be because people don’t know much about acupuncture, or they haven’t heard about it much. They may also feel intimidated by the use of multiple needles, or maybe the procedure and the principles it’s based on are just too unfamiliar. However, acupuncture isn’t difficult to understand, and it’s also generally painless. Acupuncture needles don’t prick the way that other needles do, since they’re very fine and aren’t meant to pierce through veins. At worst, you may have some bruising around the areas in which needles are inserted, but acupuncture is generally low-risk if you go to a licensed and skilled practitioner. Acupuncture is an integral component of traditional Chinese medicine (TCM), which views health and healthcare differently from Western medicine. According to the principles of TCM, our physical emotional and mental health is governed by an energy source called qi (pronounced “chee”). Qi should flow through the body along markers called meridians. However, when this flow is disrupted or gets bunched up around certain meridians, it can result in symptoms of ill health. TCM practitioners use a variety of techniques to restore the normal flow of qi, and these techniques include acupuncture. Acupuncture entails the use of needles, which the practitioner inserts at acupuncture points relevant to the symptoms of the patient. These needles simulate the acupuncture points and induce qi to return to its healthy flow. 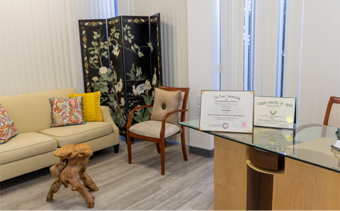 At the Santa Barbara Herb Clinic, you can learn more about how acupuncture works from Tram Pham, the clinic’s owner and resident Licensed Acupuncturist. Tram has a Master’s Degree in Chinese Medicine from Yo San University in Los Angeles. She also has years of experience patients using the principles of TCM. Scientific research has shown that acupuncture for orthopedics can be quite effective, and can help manage the symptoms of osteoarthritis and osteoporosis. Studies have shown that acupuncture can help reduce pain in the joints, thus helping patients become more mobile. Acupuncture can also have advantages over nonsteroidal anti-inflammatory drugs (NSAIDS) and other pain medications. Acupuncture is all-natural and low-risk, while NSAIDS and other types of medications can have a plethora of side effects. In the case of osteoporosis, studies have also found that acupuncture and herbal medicine can make drug therapy for pain relief more effective. A combination of calcium carbonate, vitamin D, and Calcitonin-Salmon was 80% effective in managing pain. However, a combination of electroacupuncture, herbal medicine, vitamin D, and Calcitonin-Salmon was 92.5% effective. Acupuncture for orthopedics can be an alternative treatment, but it can also work quite well with Western medicine. Make sure to consult with your physician first before you book an appointment for an acupuncture session. The Santa Barbara Herb Clinic has been providing the city of Santa Barbara with all-natural and holistic healthcare since 1986. With us, you can be sure that acupuncture for orthopedics is safe and effective. You can book an appointment with us by calling us at 805-563-0222 or emailing us at info@santabarbaraherbclinic.com. You can also have a consultation with Tram over the phone or via video call. The clinic is open from Monday to Friday, 9am to 5:30pm. Contact us now and start your path to natural and low-risk pain management.